Straddling the line of obscurity somewhere between vaporwave and sea punk exists witch house. During the early part of the decade, a variety of experimental electronic musical movements were birthed out of an insular and self indulgent Soundcloud movement led by bedroom producers around the world. The most popular genre to come from this ill-defined scene was undoubtedly the slow and viscous nostalgia driven genre known as vaporwave. Second place is awarded to witch house. The genre mixes bass grainy bassy synths with intruding electronic jabs and trap inspired drum beats while sampling pitch shifted vocals. It’s the musical equivalent of a Halloween rave. Witch house saw minimal mainstream attention after being conjured in a proverbial genre pot. But according to Google’s trend explorer, there is a huge surge in Google searches for the genre starting late September all the way until mid-November. And that’s where we find ourselves right now. 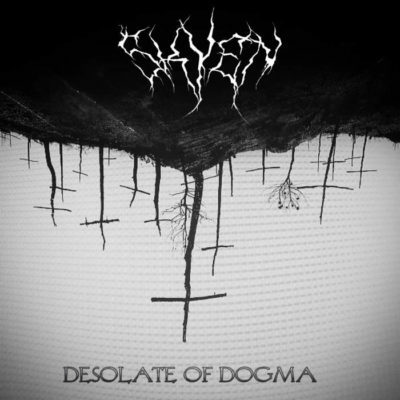 Desolate of Dogma is the most recent release by Polish witch house producer, S K Y E N.
The artist characterizes himself as post-witch house, a slower more drawn-out iteration of witch house. Light and Air slows down the tempo to a moderate pace adding in guitar and viola to a cold grim soundscape. The album’s opener and namesake goes even darker and finds refuge in a deep mix of granulated synthesizers while gloomy operatic chants and heavily reverberated drums provide the backdrop. Like molasses, the song moves slowly, picking up additional debris and digital distortion, creating a dense wall of sound before fading out. The only song with a feature (a vocalist named Naira), The Sickness ups the ante on chaos, a complete cacophony comprised of distorted 808 drum hits and a voice so convoluted and warped it can hardly be discerned as an actual woman singing. Heavenly Soul and Until Eternity fills the mold of traditional witch house music, but does so in a way that is neither offensively bland nor rigidly predictable. It’s clear that S K Y E N wants to revitalize a genre, which by design was meant to be obscure and self-contained by incorporating new, while somewhat unambitious ideas. But at the end of the day the envelope was hardly moved. There’s nothing grotesque about this album and maybe that’s why it falls short in a genre that was created to channel violence, intensity and occult imagery.